How to shift from a "fix it" mindset to approaching the body with more kindness and acceptance. One thing I’ve noticed in my classes and retreats recently is people are struggling—not just with their minds during meditation, but their bodies. It’s a conflicted relationship. Mindfulness teaches us to keep coming back to the present moment as we experience it in the body, like the breath in the mindfulness of breathing meditation. It’s good to remember that the body is always in the present moment. So many of us struggle with our body: the way it looks, the way it is built, the way it “performs,”—or doesn’t. I see that all the time in the classes I teach. “I’m not flexible” or “I’m too fat”, “I’m too old,” “too sick,” “too ugly” “too clumsy,” “too messed up,” “too…”. We are not doing so great with appreciating—or at least accepting—the body. When we give up the identification of “I, me, mine” with our body for even just moments at a time, something miraculous can happen. We can relax. We can ease up. If the body is not personal, not “mine,” then I can release the idea that it’s entirely in my hands to change what I don’t like about it. Then my body is not “my fault” and I can release for a moment the felt responsibility to fix it. As soon as I can let go of that, I can open up and my body awareness and perception can change significantly. When we give up the identification of “I, me, mine” with our body for even just moments at a time, something miraculous can happen. But, you might say, the term “today’s body” is too impersonal and makes the body into an object. Don’t we want to try to love our body more and be more in tandem with this body? Yes, absolutely. And yes, the idea of “today’s body” is impersonal. That is actually the point. Think about it this way: What happens to my experience when I take it so personally? If I love my body, that’s not really an issue. But what if I don’t? That can make me feel like a failure that I can’t change whatever is bothersome in this moment. It can be as simple as not being able to do a forward bend in a way that the other people in the class can do or as difficult as having a chronic health challenge or simply hating one’s body or certain body parts. Even if my body hasn’t changed one bit by tomorrow, the flow of body sensations and my mood will have. They never stay exactly the same. When we use the element of time in our experience we open up to the truth that perceptions change. The way I feel right now is probably not the same as I felt yesterday or I will feel tomorrow. Maybe not even like I felt 10 minutes ago. Even if my body hasn’t changed one bit by tomorrow, the flow of body sensations and my mood will have. They never stay exactly the same. As we practice mindfully with the idea of today’s body we can see more clearly that everybody has “today’s body.” We all share that. And that might make us feel more connected with the other people around us. You can do these practices for “today’s body” sitting or lying in a relaxed way or as part of your regular meditation. Mindfulness: This is “today’s body.” Feel into the body as it is right now. What’s that like? Shared humanity:Reflecting: Every human being has a body (and so does every animal). This is what it feels like to have a human body. Or a male or female body. Or a gender fluid body. Gentle touch:Try touching the body with kindness, like simply putting a hand on the body part you are practicing with. We are hard-wired for supportive touch and often that can get the message of kindness and support over like nothing else. If you are struggling with your body or parts of your body, use this compassion practice instead of just loving-kindness. Shared humanity: Reflecting: Every human being has a body (and so does every animal). This is what it feels like to have a human body that is hurting. This is what is feels like to have (for example) a headache, or immobility in the knee after surgery, etc. And thousands of other people feel the exact same thing. See if you can touch into a sense of solidarity with all the other people who know this pain, too. Gentle Touch: Try a caring gesture, like putting your hand on the hurting body part, or even caressing it gently, the way a loving parent would hug a hurting child. These practices can greatly change the way you experience your body and may even lead to serious body love. Give it a try! * For a guided audio of a loving-kindness body scan visit Christian Wolf’s website. Christiane Wolf, MD, PhD is a physician turned MBSR and mindfulness teacher and teacher trainer. She is also a Buddhist teacher trained by Jack Kornfield. 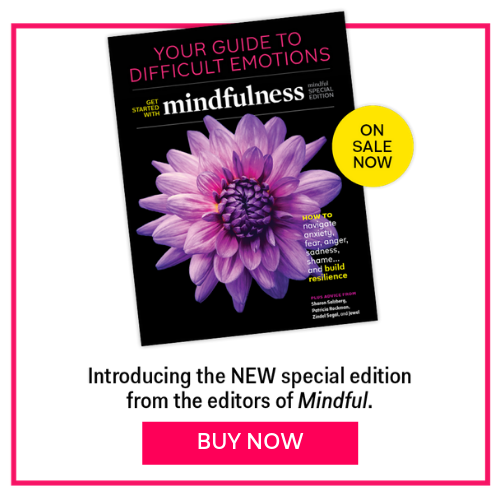 She is the co-author of A Clinician’s Guide To Teaching Mindfulness. She teaches in the US and in Europe and locally at InsightLA in Los Angeles where lives with her husband and their three kids.